This picture shows a pile of 105 mm shells spent during the course of a single day. The original caption reads: “Official photograph taken on the British Western Front in France. Some shell cases on the roadside in the front area, the contents of which have been dispatched over into the German lines”. Probably the craziest aspect of World War One was so the called “creeping bombardment“. For those unfamiliar with the term, a creeping barrage is where artillery rounds are fired just in front of an advancing line of infantry, to clear barbed wire and other defenses. A creeping barrage was designed so as to place a curtain of artillery fire just ahead of advancing infantry, a barrage which would constantly shift – or creep – forward directly ahead of attacking troops. Such a method of artillery fire necessarily required very careful planning by both artillery and infantry commanders, particularly with regard to timing if an army’s own troops were not to be caught (or held back) by their own artillery barrage. As a rough rule of thumb a creeping barrage would progress at the rate of approximately 50 meters per minute once an attack began. Imagine trying to perfectly synchronize an operation like that without radio or GPS. Imagine the gunnery skills needed to fire shells with such accuracy, usually from several miles behind the line. Imagine the stress of aiming that gun, knowing that a tiny error in your calculations would kill dozens of your own men. Imagine advancing almost blind into enemy territory, hoping that the dust and smoke don’t conceal a machine gun emplacement that survived the shelling. 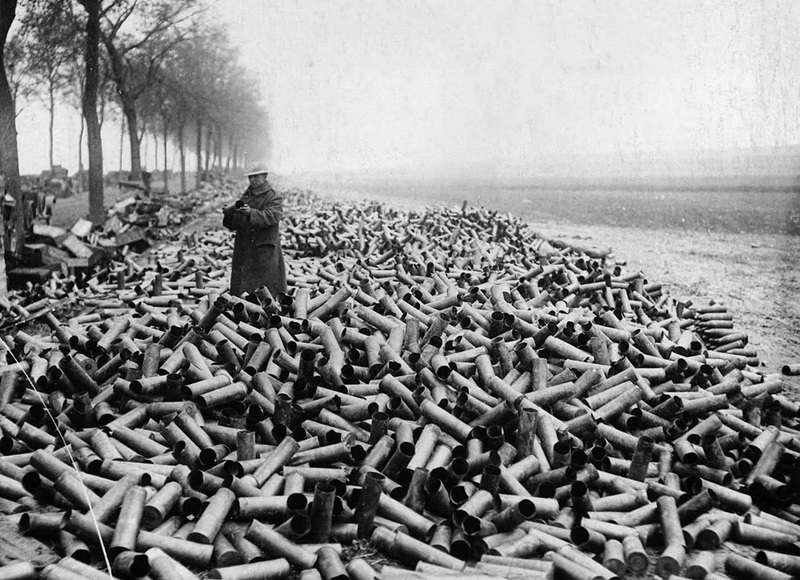 The number of artillery rounds fired during World War One was 1.2 billion. Some say there were 8 billion rounds fired but that amount is exaggerated and not true. Officially the British fired around 175 million rounds throughout the war, we might assume the French to have done the same , with the Germans and Austrians matching the number, while the Russians, Americans and Italians contributing with a lower number. All in all, somewhere between 900 million and 1.2 billion rounds were fired.